A water channel in Petojo Selatan Urban Village, Gambir is normalized in order to follow up locals' request.
" After passing through draining, it is hoped able to minimize puddles"
"We drain the channel and repair the sheet pile. 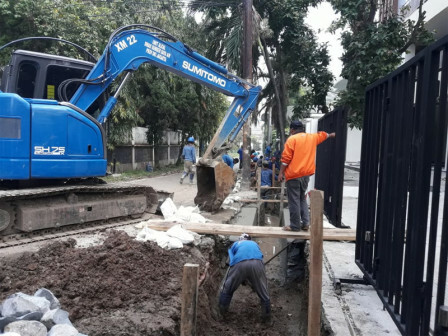 Due to silting, there are many sheet piles collapsed," expressed Boris Karlop Lumbangaol, Section Head of Maintenance for Central Jakarta Water Resources Sub-dept., Thursday (8/9). He stated the channel drained are the environment channel on Jalan Petojo Sabangan 1 and 2 as long as 150 meters and channel on Jalan Taman Tanah Abang 3 as long as 150 meters with 80 centimeters width that connects with Cedeng River. "We've repaired the collapsed sheet pile. After passing through draining, it is hoped able to minimize puddles," he uttered. To conduct it, around 20 officers and 1 mini excavator have been deployed to the field since July. The work is targeted to be finished one week ahead.